Located on the north shore of O‘ahu, Pūpūkea and Waimea Bay Beach Parks are separated by a small residential section of Waimea town. Take Kamehameha Highway (Hwy 83) from Hale‘iwa or Kahuku to Waimea. Parking is available at both beach parks. Bus service to the area is available daily. The MLCD is located offshore of both beach parks, from the highwater mark seaward 100 yards along a line extending due west of Kulalua Point at the northern end of Pūpūkea Beach Park, then southerly to the most seaward exposed rock of the Wananapaoa Islets on the south side of Waimea Bay (including the islets), then due southeast to shore. 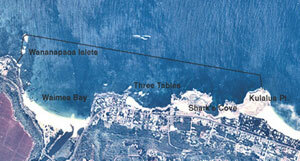 The district includes two major swimming areas, Shark’s Cove and Three Tables, and the offshore waters. The tidepool area to the left of Shark’s Cove, though not part of the MLCD, is good for reef walking or snorkeling, depending on wave and tide conditions. Shark’s Cove, near the northern end of the MLCD, is a popular site for snorkeling, and is fairly shallow. Depths range up to 20 feet at the cove’s mouth. Diving conditions are better outside the cove. Caves can be found around the cove’s northwest point, and to a lesser extent to the south. The area to the left of the cove offers excellent night diving. The bottom outside the cove slopes to about 45 feet. Visibility is generally poor inside the cove, but improves quickly outside. The origin of the cove’s name is uncertain, but sharks are no more common here than anywhere else on the island. Shark’s Cove is one of the North Shore’s most popular SCUBA destinations. Three Tables cove, located at the district’s southern end, gets its name from the three or four flat sections of reef visible at low tide. Snorkeling is good around and just outside the tables area, and diving conditions improve farther out. Water depths near the tables average about 15 feet, and the best diving is at depths of 30 to 45 feet. Many ledges, arches, lava tubes and other features are found near and outside the tables. Waimea Bay is primarily a swimming and surfing destination. On the bay’s right side there is some good coral growth in about 20 feet of water off the rocky point. From about May through October the water is generally calm, but surges are possible. During winter months current and wave conditions become extremely dangerous in all areas of the MLCD, as well as the tidepool area. Lifeguards are on duty at Waimea Bay, but not Three Tables or Shark’s Cove. A fire station is located near the tidepool area. To take and possess up to two pounds (combined total, squeezed dry) of limu kohu and limu lipe‘epe‘e by hand harvest only, provided the limu’s holdfast is left in place. To possess a knife for personal safety only. To take and possess any finfish with hook-and-line from the shoreline, with not more than two poles per person and one line per pole, with no more than two hooks per line. To take with legal nets and possess ‘ōpelu during August and September, and akule during November and December. To snag any akule while fishing from the shoreline of Waimea Bay according to “permitted” activities above.